This is a one pan, easy meal that’s PERFECT for weeknights and lazy evenings! 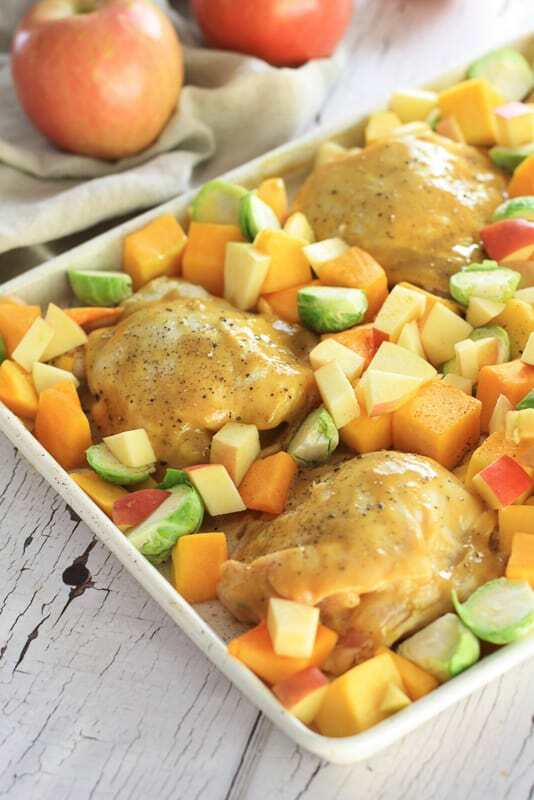 Cozy for Fall, feeds the whole family, this Maple Dijon Chicken with Roasted Fall Vegetables will be your new go-to! Save some extra sauce and drizzle on top. I had some bone in, skin on chicken thighs I needed to use. SO- I whipped up a little mixture of maple syrup, along with some dijon, and slathered it on my chicken. I’ll warn you first- it will crust around the edge of the pan from the sugar, but fear not! Just place your veggies more towards the center and you’re good to go. I bought pre-cubed, fresh butternut squash from Whole Foods via Amazon Fresh (btw- Amazon Fresh is the absolute best thing to ever happen to me….Anybody who brings me things that include wine and chocolate are my best friends). I also try to minimize any chance of cutting myself wherever possible- I am an accident waiting to happen and butternut squash are a pain in the squash to cut. Slather, chop, roast, and dinner is done! Next I chopped the stems off of some brussel sprouts, sliced them in half, and added some cubed apple pieces as well. 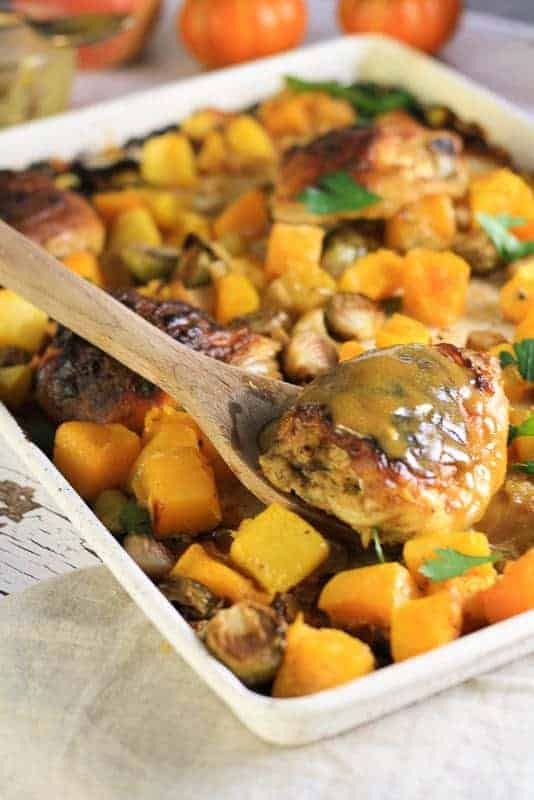 The butternut squash, apples & brussel sprouts roast up SO nicely together in the oven- sweet, savory, and just SO delicious! Juicy, delicious and SO cozy! Bake for about 45-50 minutes at 400 degrees, and boom! A perfect one pan meal. If you need a carb, serve with either rice or quinoa (which you can bake at the same time using THIS recipe for 1 pan oven baked rice). You CAN use chicken breasts, but the star of this dish is really the bone-in, skin on chicken thighs. They’re rustic, and the maple dijon sauce really permeates the skin creating a delicious crust. If you decide to use chicken breasts, cook for 30 minutes on 375, or until 365 degrees internally. Not a fan of the veggies we used? Mix it up! Sweet potatoes, acorn squash,pears, green beans, broccoli, even cauliflower would be delicious roasted. REALLY want to amp up the fall vegetables? Add in a bit of cinnamon to bump up the cozy factor! Stay away from lining your pan with foil on this one- spray your pan directly with non-stick spray. Foil will get messy and stick too much to the chicken. Don’t have a sheet pan? Use a cast iron pan or a dutch oven with the lid off. This delicious one pan meal comes together in a pinch and tastes like cozy feels! Preheat oven to 400 degrees fahrenheit. Spray sheet pan with nonstick spray. 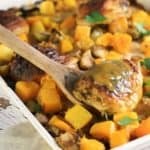 In a small bowl (but large enough for a chicken thigh) mix maple dijon sauce ingredients. Fully coat each chicken thigh in bowl. Place fully coated chicken thighs on sheet pan. Sprinkle veggies towards the middle, but not on top of the chicken (keeping veggies and apples away from edges of pan as some of the maple/dijon mixture will darken). Sprinkle entirety of pan, coating chicken and veggies/apples with salt and pepper. 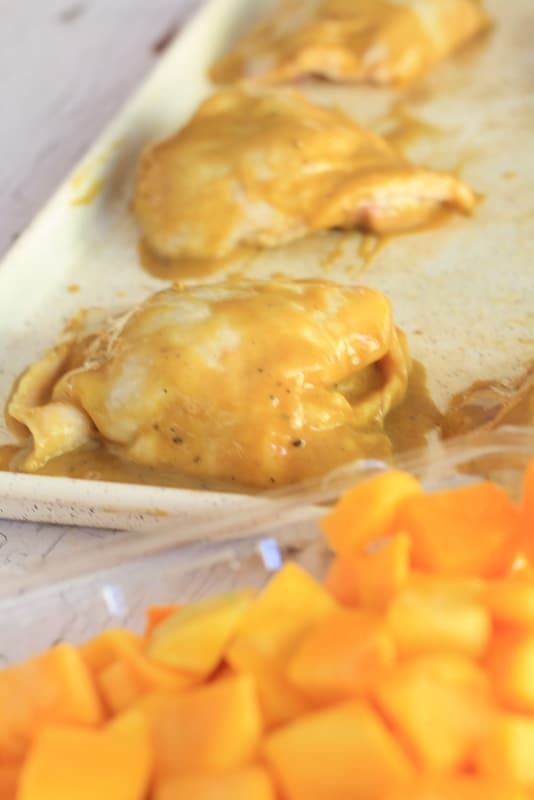 Bake for 45-50 minutes, or until chicken reaches internal temperature of 165 degrees. If you find your meal getting roasted beyond your liking, add a piece of foil on top. You CAN use chicken breasts, but the star of this dish is really the bone-in, skin on chicken thighs. They're rustic, and the maple dijon sauce really permeates the skin creating a delicious crust. If you decide to use chicken breasts, cook for 30 minutes on 375, or until 165 degrees internally. Don't have a sheet pan? Use a cast iron pan or a dutch oven with the lid off. Save some sauce to drizzle on top! Brush it on with a baster brush, or simply spoon some on top. If you give this a try, let us know what you think! Tag us on instagram @laughingspatula or #laughingspatula. We love to see your pics and SERIOUSLY love being apart of your family's food life! Thank you for the nice note Sue! No need to toss the veggies in olive oil? Hi Lana- I do not. But you can! 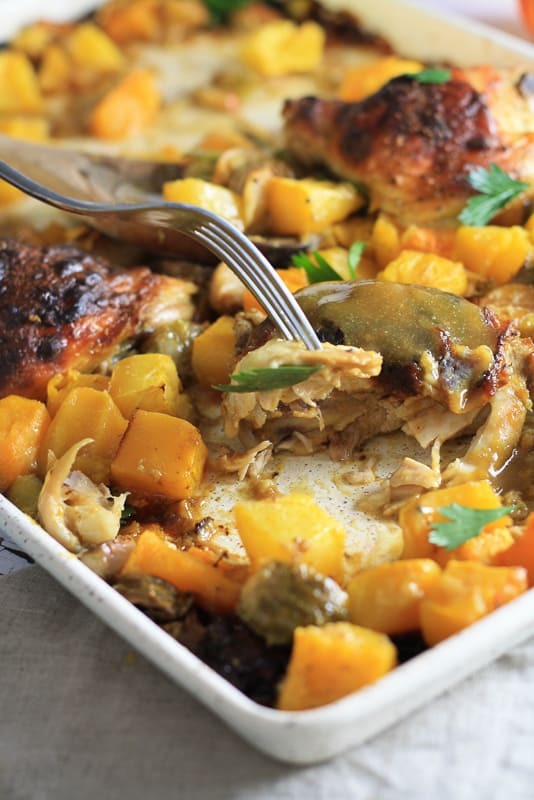 Super easy and delicious – is a new fall, weeknight favorite! Used carrots, cauliflower, sweet and white potatoes, and apples. 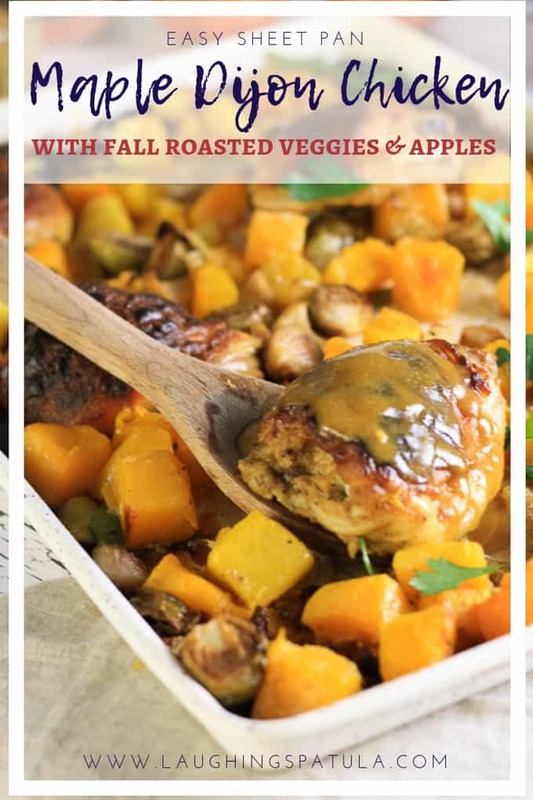 Tastes and looks like fall on a plate! I’ll definitely take you up on that cinnamon suggestion! Great recipe!